This piece originally ran on April 21st, 2015, in The Leaf Online as, “Nip it in the Bud: Cannabis Farming Is Not Causing California’s Drought.” It was picked up and ran by AlterNet on April 22nd, with the title, “Weed and Water in California: Pot Isn’t The Problem.” All photos were taken by me, while visiting family in the Central Valley in 2009. “Nip in the bud” – To break a bad habit before it forms. There’s nothing new about bad cannabis science, but now in the days of cannabis policy reform it often seems that new examples are cropping up every day, hoping to mislead the public into believing the ‘virtue’ of prohibition. Time to nip them in the bud. Notice the blue sign that says “Almonds.” This *was* an almond field, now it lays fallow. 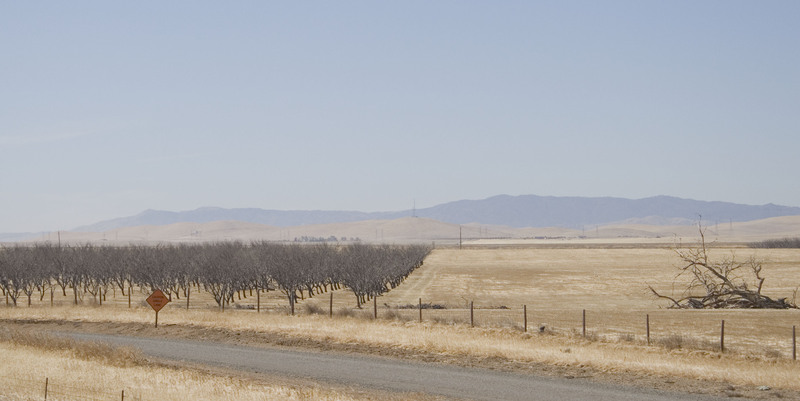 These may have been almond trees, before the ‘Congress created dust bowl’ came and turned off their water supply. If better decisions aren’t made to confront the current drought then dead orchards like this will be an all too common sight. In response to the Reefer Madness panic over the minuscule amount of water being used for cannabis growing the legislature has released two bills, AB 243 and a similar bill in the Senate,SB 165. Both laws would strengthen existing laws governing cannabis farming and other illicit activities on public and private lands. The patient advocacy group, Americans for Safe Access, opposes both bills as they currently stand and feel patients are being unfairly scapegoated. ASA makes a good point considering other groups, like Nestle, are allowed to skirt legality to bottle millions of gallons of groundwater every year to sell bottled water back to the same people they took it from.